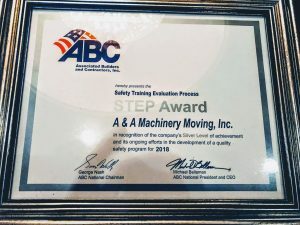 A&A Machinery Moving, Inc. was recently recognized as a Silver S.T.E.P. Award recipient by the Associated Builders and Contractors Eastern PA Chapter. The ABC Membership Achievement Dinner was held at the historic William Penn Inn in Montgomery County, PA. The dinner celebrates the company chapter member’s commitment to worker safety and training. For those who have worked with A&A Machinery know how important the safety of their employees is to the company. The ABC’s Safety Training Evaluation Process (S.T.E.P. ), established in 1989, was written and developed by contractors, for contractors. The S.T.E.P. program provides safety benchmarks and enhancement tools that have shown to improve safety performances among the program’s participating companies. Participating companies measure their safety performance and policies through an evaluation of 20 key components with the goal of implementing and enhancing safety programs that reduce job site incident rates. A&A Machinery wants to send all employees home from work safely every night. Applying to the ABC S.T.E.P. program was another step (pun intended) towards achieving top-notch company and employee safety. Back in 2016, A&A established its own company safety committee with the goal of making the workplace a healthier and safer environment for all employees. The safety committee consists of management and team member representatives who have interest in promoting safety and health for the A&A team. The committee is responsible for making recommendations on how to improve safety in the workplace, identifying problems and hazards, and constructing corrective actions for the company. 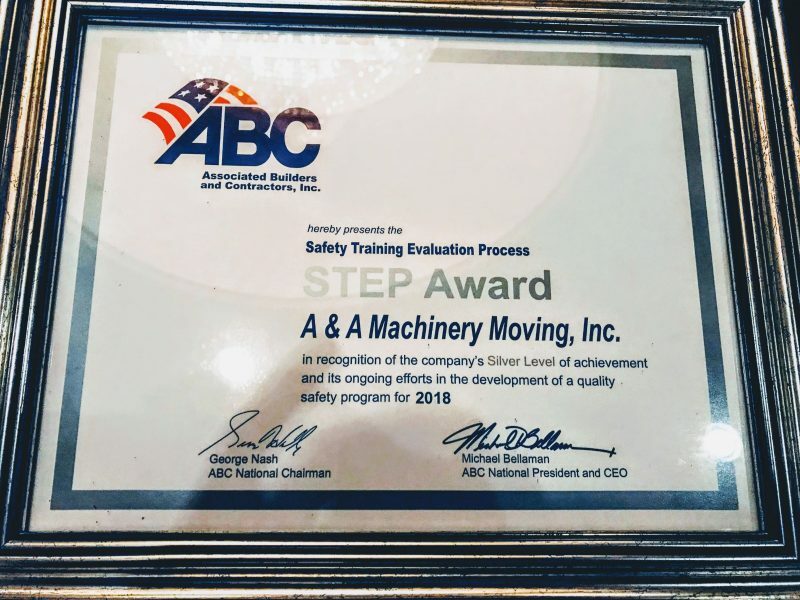 A&A Machinery Moving, Inc. would like to congratulate all other ABC S.T.E.P. Award recipients and their commitment to worker safety and training.